For other uses, see Yancheng District (disambiguation). Yancheng (Chinese: 盐城; pinyin: Yánchéng) is a prefecture-level city in northeastern Jiangsu province, People's Republic of China. As the city with the largest jurisdictional area in Jiangsu, Yancheng borders Lianyungang to the north, Huai'an to the west, Yangzhou and Taizhou to the southwest, Nantong to the south, and the Yellow Sea to the east. Yancheng, literally "Salt City", is named after the salt harvest fields surrounding the city. According to historical records,[which?] collection and production of sea salt in the region began as early as 119 BC, during the Western Han Dynasty, when the settlement on the current location of Yancheng was named Yandu County (盐渎县). According to the 2010 Census, Yancheng has a registered population of 8,203,728 — with 7,260,240 permanent residents. Its built up area of Tinghu and Yandu Districts was home to 1,615,717 inhabitants in 2010. The prefecture-level city of Yancheng administers 9 county-level divisions, including 3 districts, 1 county-level city and 5 counties. The population information here presented uses 2010 census data of permanent residents. Yancheng has a history of 2,100 years since the first canton was founded here in Han Dynasty at year 119 BC. It was named for the salt reserves in rivers around the area, its name literally meaning "Salt City". In later years, the city was the home of Fan Zhongyan, the 12th century statesman and Shi Nai'an, the reputed author of famous novels. Yancheng was in the limelight during the Chinese Civil War from the 1930s to 1940s. The New Fourth Army led by the Communist Party of China was reestablished in Yancheng after being ambushed and battered by the enemy. After the revival, the Army played a very important role in the war and finally the foundation of the People's Republic of China. Many monuments in honor of these heroes can still be found around Yancheng. Yancheng occupies roughly 582 km (362 mi) of coastline, more than half of the whole province. By the end of the Mesolithic period, the marine transgressions changed almost of the area into a shallow bay. Continued deposition of silt carried by the Yangtze River and the Huai River extend its coast to the east gradually. Since 1128, the course of the Yellow River have changed to join up with the Huai River. The change has accelerated. Yancheng has a temperate climate with fairly mild winters and distinctly tropical late summers. Under the Koppen climate classification, the city has a humid subtropical climate. Xinyi-Changxing Railway runs through the city. The BRT system of Yancheng uses a dedicated bus lane. The first line went into service since 2010. Yancheng Nanyang International Airport now flies directly to Shanghai and Beijing, as well as flying directly to Hong Kong, Taiwan, South Korea, Japan and so on. The economy of Yancheng City has sustained its momentum. Preliminary statistics found that in 2015 gross regional products of the city was RMB 421,250,000,000, a 10.5 percent increase by comparable price from previous year. Agriculture has increased by RMB 51,653,000,000 in value, a 3.6 percent increase from previous year; industry has increased by RMB 192,547,000,000 in value, a 10.5 percent increase from previous year; tertiary business has increased by RMB 177,050,000,000 in value, a 12.5 percent increase from previous year. Gross regional products per capita was RMB 58,299 (or USD 8,862 at the average exchange rate of 2015), a 10.4 percent increase from previous year. Outdoor activities include the Yangcheng wetlands and salt marshes, home of some unique and endangered species, including Père David's deer and the red-crowned crane. There is also a famous food street in east road springing up in recent years in which stands many restaurants in the style of Huizhou architecture. Yancheng is twinned with the following domestic and foreign cities. 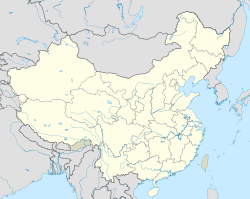 In addition, the county-level city of Dafeng, administered by Yancheng, is also twinned with Ascoli Piceno, Italy (September 2001) and Guri, South Korea (February 20, 2003) respectively. ^ a b "Yancheng Introduction (Yancheng Middle School)". Wikimedia Commons has media related to Yancheng. Yancheng Introduction (Yancheng Middle School) Extensive background on Yancheng history.